The door is made of stainless steel. Inside are filled with foam and wood. Wing panel’s 55 mm thick building block construction,filled with foamed polystyrene. Locking system is made of two locks embedded in special part and head-on pressings of sheathings and protective cassettes fixed to the stile. The combination of all the above elements gives a highly insulated and rigid wing construction. It it supplied to customers in the folded form which makes installation of doors in the hole much easier and faster. It has anti-burglar reinforcements in hinge parts and locking points. Positioning of the frame in walls using the assembly doweling strips to the wall with dowels Both the strips and the dowels are included in the assembly set that comes with the door. The wing is filled with a high quality foamed polystyrene with a lambda & lambda = 0, 04W/m2K. Dual sealing system. One in the dap of frame, the other in the supporting part of the wing. They reduce vibration and the loss of heat in the room, they do not lignify, they do not change the volume under the influence of atmospheric conditions. The door is closed with a two multipoint locks entered with cylinder europrofile inserts delivered by one of the leading producer of anti-burglary security solutions. The locking system is complete with solid anti-unhinge pins located on the hinge side of the wing. Glass doors are made using certified multi-window packages and warm plastic profiles from renowned producers. Domadeco is a unique contemporary online store offering great designs and high quality products at very attractive prices focused on all types of Clients and their personal needs. 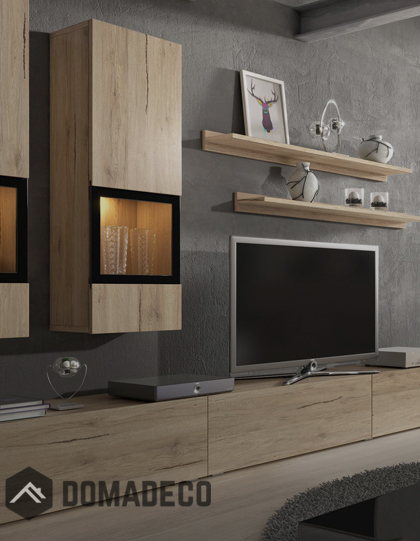 We have everything you need for your home like furniture, home accessories, internal and external doors. Domadeco is recognized as but now operates under a new brand.